It's time I earned my stripes. Its Dear Jane time. 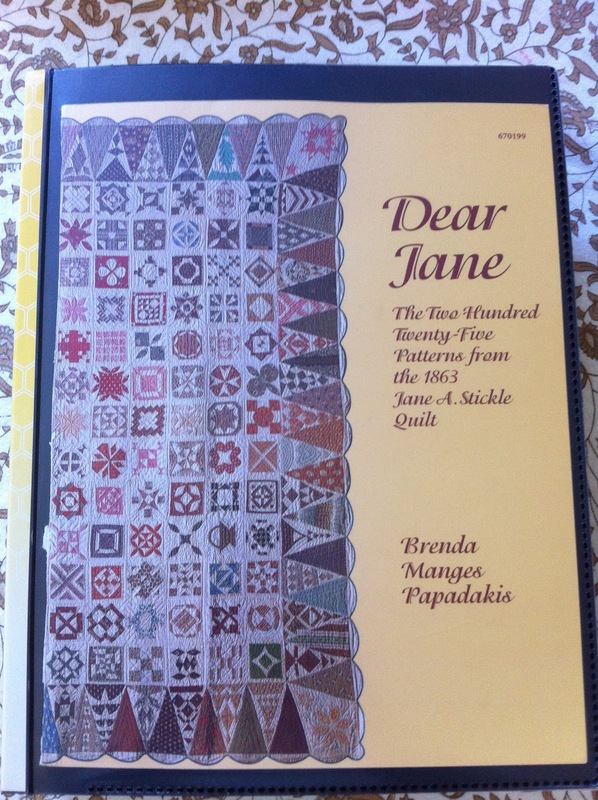 For anyone who doesn't know, the Dear Jane quilt movement has been kicking around the globe since the original Dear Jane book was published in 1996. 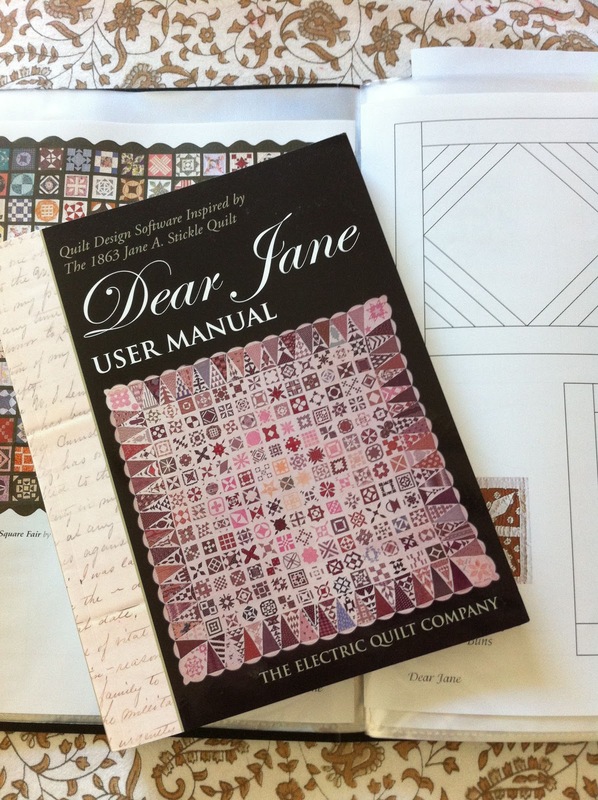 Most blogs on the net about the Dear Jane quilt (and there are hundreds) start with the basic details about this amazing quilt. The original quilt was made in during the American Civil War by a woman named Jane Stickle. We know who she was, she embroidered her name and the date and the very poignant words "in a time of War" in one of the corner triangles. You can find out more about her and the quilt here. 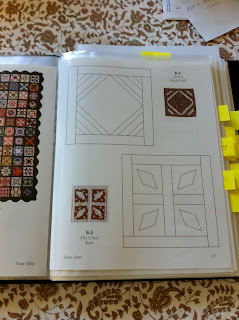 I'm going to be really honest, I am not a fan of repro quilts, I have always liked to do my own thing. If you look through my blog, I guess you can see that in what I have done. Four years at Design School have really hit hard with me. I have to say that there is something so special about this quilt. it seems to appeal to every one. There are versions of this quilt made with 30s fabrics, moderns, brights, neutrals, repros ... anything. It can appeal to anyone, Jane Stickle was a great designer and she never knew it. She probably felt she was no one special, and yet here we are over a hundred years later making her quilt. 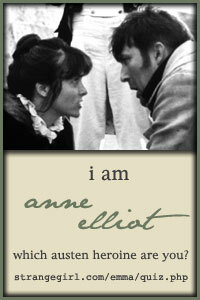 So, along with all the other projects I have on the boil, I am adding Jane to the list. Starting from today. I am aiming at one block a week, and I thought I would see if anyone else is interested, we can start a Jane-A-long. If there is interest, I'll do up a button for blogs etc and lets get cracking. This quilt requires some preparation. Well, it does if you have hidden OCD tendancies. 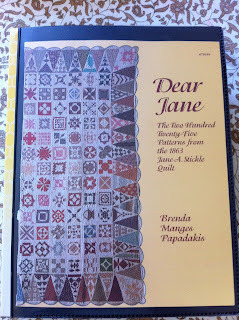 A lot of folks who have done a Jane quilt have given plenty of great tips, I'll put some here. 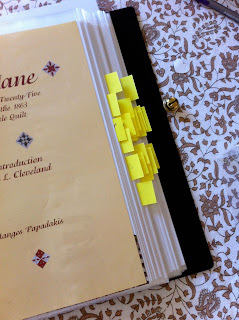 A lot of Janiacs pull their books apart and put the contents in folders. At first I was horrified. Pulling apart a book, oh mercy! But ... when you see the book you get the idea why. 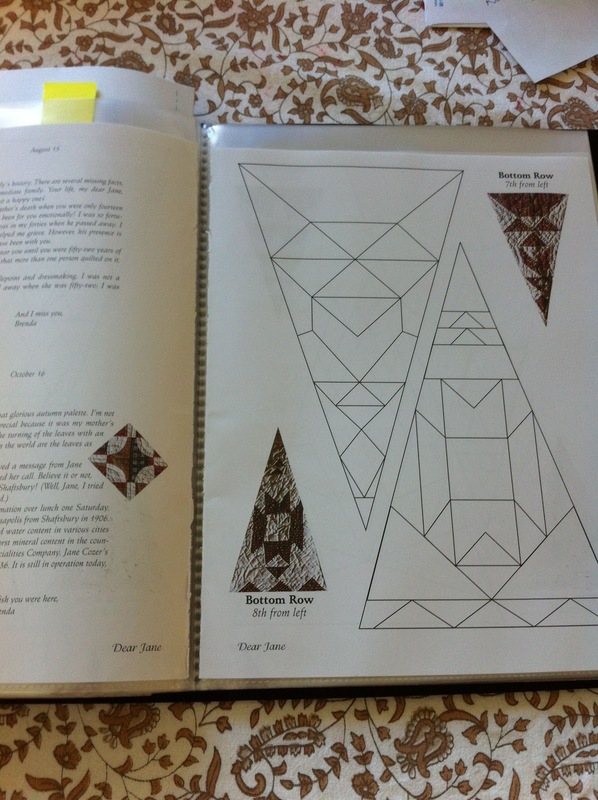 The book needs to be pulled open to copy the patterns. Either way you look at it, the spine of the book is going to get trashed so its best to pull it apart and stick it in a folder. There are a lot of blocks in this quilt, 225 in all. 169 x 4 1/2" square blocks, the rest are triangles for around the edges. Yes, it is a lot but it is manageable. I'm going to do a block a week, and keep it ticking along while I do other bits. So getting your brain around doing 225 blocks could be daunting but one at a time ... not to bad. The folder gig really helps. This should give you an idea of what a page in the book looks like. Each block is to scale, and next to each block is a picture of the original. That's a good thing, it really helps with planning your colours and fabrics. 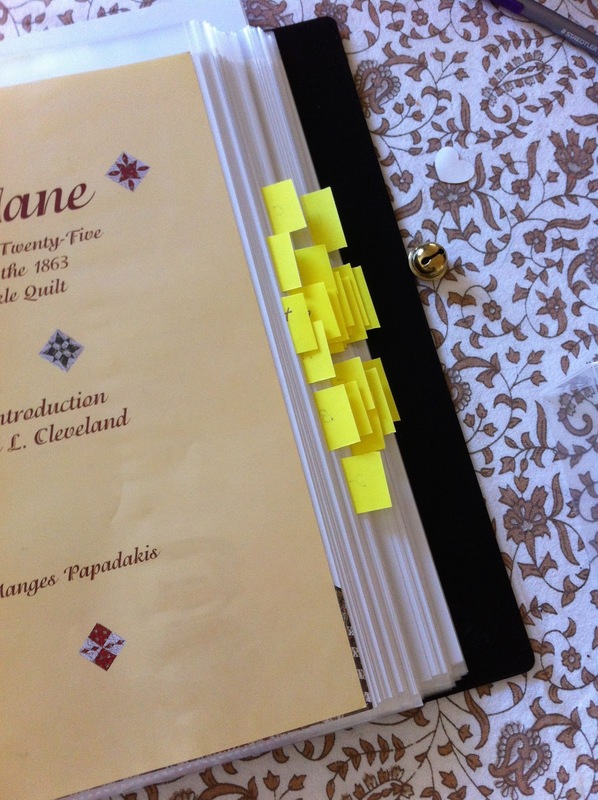 But as you can see, there are a bunch of little yellow sticky notes in my folder. These are for the block templates that don't match the pictures. Some of them don't, I am sure that the author had very good reasons for doing that, but I thought I would try and make my Jane as close to the original as possible. So as we go, I'll adjust a block to what I see it to be, and post the details here if anyone wants to see it. And here is a wee look at the triangle blocks. I can't wait to have a go at these, some of them look tricky, some of them look easy. 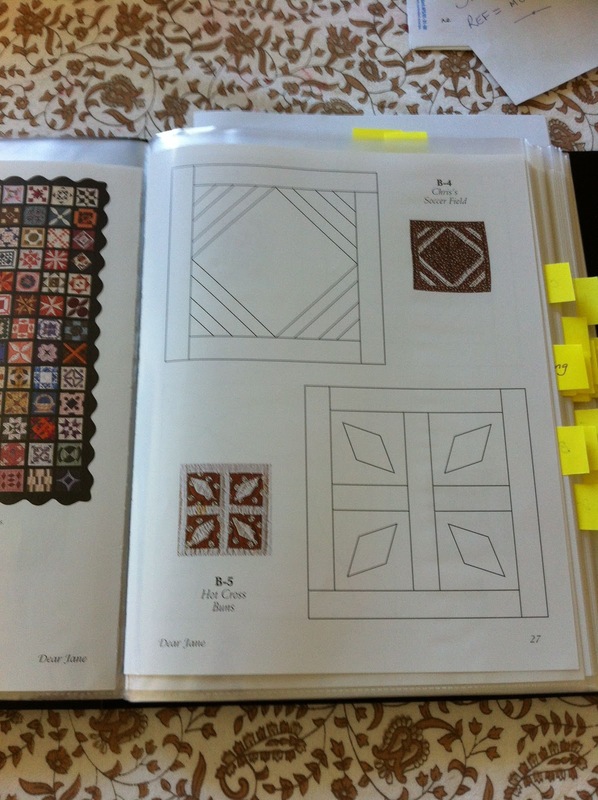 There is a great way piece of software that really helps with putting a Jane quilt together. The EQ folks have developed it. I have a mac, and I use it using another piece of software called "Cross Over" by Dream Weavers. The software gives the ability to print the templates in any size you want, play with the layout and size. Anything you need to help you put your very own Jane in any size together. It seems to be universally accepted that this quilt needs a lot of fabric. I was very sceptical at first but no, after a bucket of research it seams that 15 yards of fabric is needed for the background of the quilt. That will cover sashing and borders and backing etc. I can't get a clear indication from anywhere exactly how much printed fabric is needed for the quilt, so I have attacked my stash and I have a jelly roll, some FQs, some yardage and a fat 8th bundle (coming from Hancocks of Paducah) all ready to go. I'll post some pics in the next day or two of the fabric I have chosen for my back ground and my prints. My Jane has a very french feel : ) Are you doing a Jane quilt?